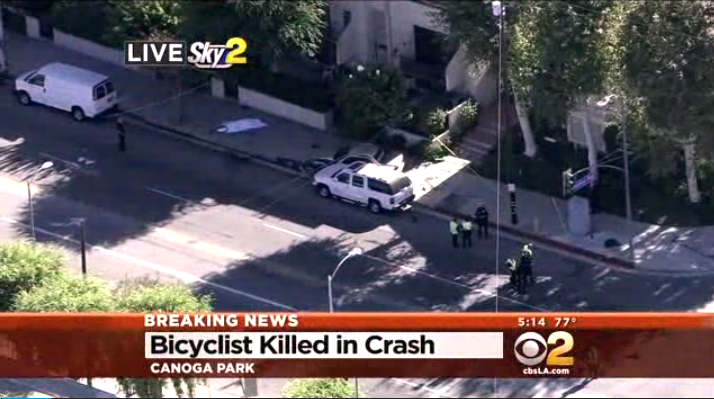 Two people were injured and another, a bicyclist, killed in a two-vehicle crash Thursday. The crash happened in West Hills just before 4 p.m. The person killed was a woman bicyclist in her 40s who was standing on the sidewalk when the accident happened, which was at the corner of Sherman Way and Shoup Avenue. A Toyota, heading south on Shoup crashed into a Lexus turning west onto Sherman Way. The crash sent the Toyota on the sidewalk where it hit the bicyclist, according to authorities. The two other people injured in the crash were taken to an area hospital. “It was a lot of speed in the car accident; it was quite a boom,” said Ricardo Ponzov in an interview with KCAL, who lives nearby. Investigators say they are trying to determine if the driver of the Toyota was operating under the influence. “Anytime we investigate a collision of this magnitude, one of the very first things we do is check for impairment. At this particular moment we are in the process of finding that out,” LAPD detective Bill Bustos said.